Sonova employee and Hear the World volunteer Tim visited Hear the World's aid project in Zambia. The result of his visit: a film and photos telling the heartwarming story of John who hears again thanks to donated hearing aids. In April 2017, Sonova employee working for Phonak and Hear the World volunteer Tim Ringger visited a Hear the World project in Zambia. The goal of his assignment was to document, with videos and photographs, the work of Hear the World and its project partner Sound Seekers. During his assignment Tim produced a touching and heartwarming story of how John receives the gift of hearing. The Hear the World Foundation often seeks for volunteers with an audiological background to share their expertise with local project staff around the globe. Tim knew for a long time that he wanted to support a Hear the World project one day. When the opportunity came up to support a project with video and photography in Zambia, Tim knew that this was the perfect assignment for him. During his one-week assignment in Zambia, Tim visited the project’s different sites with two representatives from Hear the World’s partner Sound Seekers. They spent the first three days in Lusaka where they visited the hospital’s ENT clinic, a school for children with hearing impairment, the hearing aid refurbishment center (HARP), as well as a school were Audiology Technicians are trained. Day four and five were then spent in Ndola where the team visited three different schools and the hospital where Hear the World donated an ear mold lab. 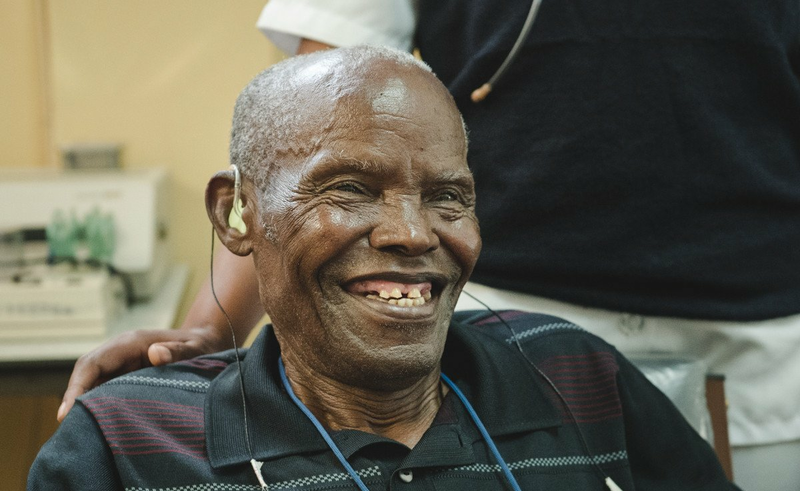 It was in Ndola where Tim met with 88 year old John, who received the gift of hearing. Tim became a witness of John’s story, narrated in his film. The Hear the World Foundation and the well-known Hamburg-based photographer Philipp Rathmer launched a very special project. In Malawi, young people with hearing loss who were recently provided with hearing aids by the foundation have been challenged to photograph their favorite sounds, which they are now finally able to hear again.